As a keyboard player you have a certain detachment from your instrument. 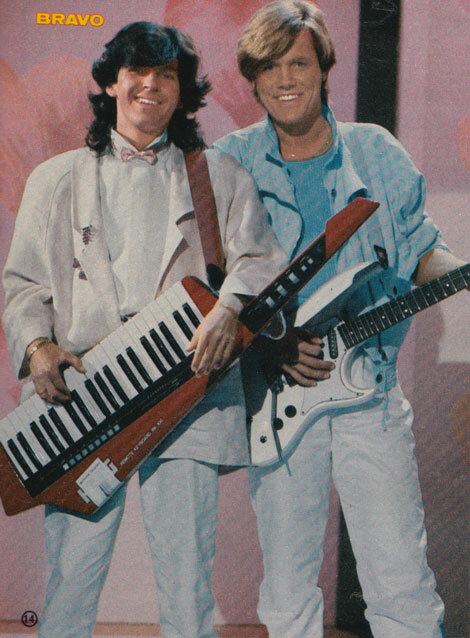 In contrast to a guitar/bass slung heavy around your neck, you don’t have much direct contact with keyboards and synths placed on a stand in front of you (don’t get me started on these “shoulder synthesizers“: I just say “Modern Talking” which should be sufficient to cover this angle. If not, click here). This feeling is multiplied when you switch from playing your instrument to programming your instrument / from stage to studio. So, I was looking for some time for a controller with pads, sliders and knobs to get back a more direct and spontaneously contact (looks cooler anyway). 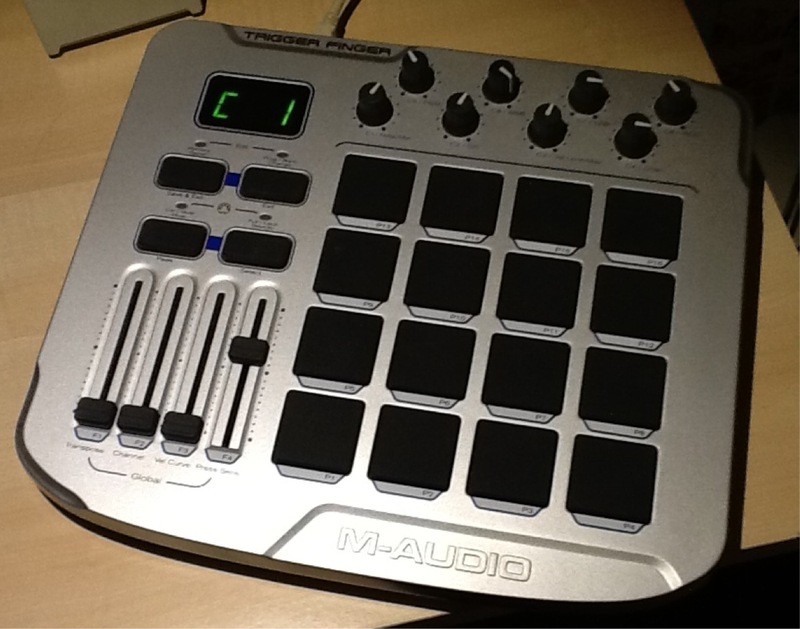 I found the m-audio Trigger Finger controller which may not be up to date but had good reviews and is affordable. After checking the (too) cheap competition from the far east via Musicstore in Cologne (Fame Tweek 100) I bought a used Trigger Finger from ebay. Step 1: Sheer enthusiasm once the tool has arrived. Touch it, smell it, cautious first steps by listening to presets, being blown away by the new sound, features, … Awesome, you’re in heaven. Step 2: (Some 60 minutes after Step 1) You try some simple things and it (or you?) fail. Long, half-hearted reading in the operating instructions, no (real) desire to learn. Grumbling because everything is sooo hard at all times. Why does it separate me from making music, instead of supporting me? The vale of tears of the novice, the newbie without a plan. Step 3b: Procrastinate, not learning at all. Blaming the tool, buying the next thing. Right now, I have trouble because the USB-Midi connection between Ableton Live and Trigger Finger goes dead after some minutes of inactivity. In this moment I’m grateful that I’m “just” sitting at my workstation and not performing live for all the nice people who paid their hard-earned money to see/hear me. According to the forum@ableton this is a known problem without solution. Seems to be a windows problem with the handling of USB ports which makes all the Mac users laugh. Really helpful, thanks. Will you keep up the effort, will you go on? It’s not easy! Remember how you learned piano (which we like to forget as soon as it’s 20 + years ago) which took years (YEARS!). You were young, you had time to practice and your parents forcing you (sometimes). And then – SNAP – after playing “Entertainer” for the nth time, it started to sound great. Some friend (or girl) listened and went “cool!” and you had this warm feeling that the effort has paid off. My cellar is full of tools that have not been able to overcome these hard times. Other tools have helped me to create cool new songs which are still cool today and I’m proud that it was me who created them. Unfortunately, I cannot foresee in advance what tool ignites this spark and which does not. So: Trigger Finger – beware, I won’t let you win that easy. Any similar experiences on your side? Any tips & tricks to stay on track? Share with me, write a comment.